nologist and university professor at Simon Fraser University, Burnaby, BC Canada. He may be contacted at www.garymauser.net, mauser@sfu.ca, and 604‐291‐3652. Chief Superintendent Colin Greenwood (West Yorkshire Constabulary, ret. ); C.B. fewer guns, therefore, mean fewer deaths. factual error and focus on comparisons that are unrepresentative. It may be useful to begin with a few examples. why (b) the United States has by far the highest murder rate. (b) is, in fact, false and statement (a) is substantially so. Susan Baker, Without Guns, Do People Kill People? No. 2] Would Banning Firearms Reduce Murder and Suicide? by a police state apparatus providing stringent enforcement. firearms and very few murders involve them. other now‐independent European nations of the former U.S.S.R.
foreign wars, ammunition for them would be unavailable in the Soviet Union). 5. See Pridemore, supra note 2, at 271.
file with authors). See also infra Table 1 (reporting Russian homicide data for 2002). 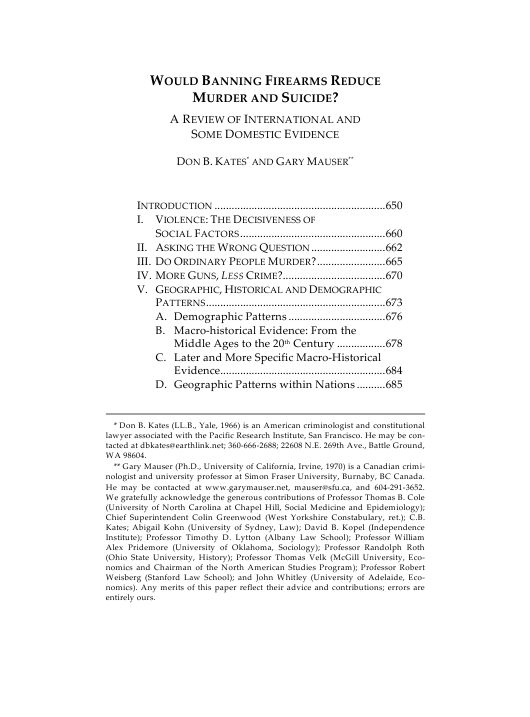 Jeffery A. Miron, Violence, Guns, and Drugs: A Cross‐Country Analysis, 44 J.L. mid‐1990s, when all were well above 10 and most were 50% to 150% higher. Id. advantage of being slower to appear than the FBI homicide data. higher than Germany in 2002.
cussing patterns revealed by studies in the United States). 26, tbl. 2‐1 (1997 draft). and for Norway and Sweden in only one year (2001). and impose no controls designed to deny guns to law‐abiding, responsible adults. , supra note 8, at 22‐23.